One of the things visitors to coastal Maine look forward to the most is visiting the beach. There’s a good reason for that, Maine beaches are some of the finest in the country! Here at Dockside Guest Quarters we’re partial to Long Sands Beach, Short Sands Beach, and Harbor Beach here in York. However, in the neighboring town of Ogunquit, there’s another great beach to visit. Ogunquit Beach, Maine is a beautiful beach with wide expanses of sand and impressive cresting waves. 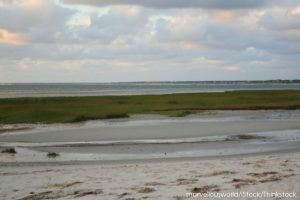 It’s a favorite among locals and visitors, so we wanted to give you some tips about visiting Ogunquit Beach, Maine. Here are a few things to keep in mind when you’re planning a day trip away from York to hit the beach in Ogunquit. The best part about going to the beach can be taking it easy and not doing much of anything. Ogunquit Beach, Maine is the perfect beach for this, as the expanses of white sand create the ideal location for lounging while catching some rays or reading a book. The beach is also ideal for walking and beachcombing. If you head to Ogunquit Beach, Maine, you should give the town of Ogunquit a look. This former fishing village and artists’ colony has charm to spare. With great local shops and galleries, you can simply pass some time in the afternoon, grab a bite, or find a special keepsake to take home with you. Marginal Way is an amazing scenic walk that goes from Perkins Cove to Ogunquit Beach. The walk isn’t difficult and there are plenty of places to stop and enjoy the glorious views of the ocean and Ogunquit. Perkins Cove is home to a variety of shops and restaurants that are worth exploring. The atmosphere is that of an old fishing village and many of the tour boats dock here. To enjoy Ogunquit Beach, Maine from a different perspective, take to the sea aboard one of the touring vessels. Go sailing on the Silverlining with Captain Jack or take a scenic cruise with Finestkind, both sail out of Perkins Cove. When you’re making your plans to visit Ogunquit Beach, Maine, be sure to make your accommodation arrangements at Dockside Guest Quarters. Our York bed and breakfast is in an ideal location for enjoying all of the activities and attractions in the area. Ogunquit Beach is just 15 minutes away from York, so you’ll have no problem venturing out on a day trip to see Ogunquit while still getting to take advantage of the charms of York. Our accommodations offer the utmost in classic New England style and modern comforts and amenities. Each morning you will be treated to a full breakfast buffet featuring homemade baked goods and a daily selection meat and eggs. And for lunch and dinner, there is no better place in York to dine than the Dockside Restaurant. We prepare amazing New England cuisine using the freshest local ingredients available. Plus, the restaurant and many of our rooms and suites feature amazing views of York Harbor. For an amazing coastal Maine experience, look no further than Dockside Guest Quarters.